Edward Gorey (1925–2000), author and illustrator of a bounty of books, produced distinctive drawings that created a new genre in graphic storytelling: the sprightly disturbing. Gorey also was a set and costume designer for innumerable theater productions from Cape Cod to Broadway, including a celebrated staging of Bram Stoker’s Dracula for which he was awarded a Tony. 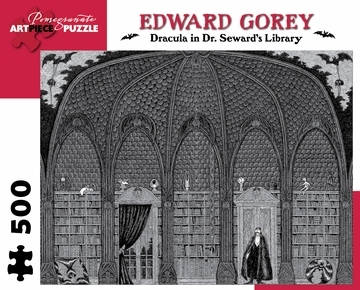 One of Gorey’s stage designs for the play is reproduced in miniature on this puzzle. Pomegranate also publishes Edward Gorey’s Dracula: A Toy Theatre, an easy-to-assemble boxed set of die-cut foldups containing the cast, props, and sets for the entire three-act drama.